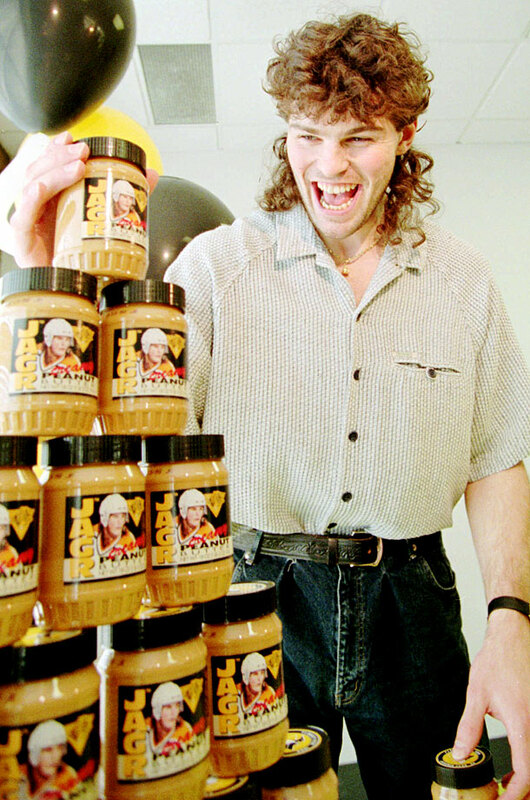 Like big name athletes in other sports, NHL stars have long been associated with foodstuffs. Here are 13 of the most notably mouthwatering examples. With burger madness consuming the NHL due to the exploits of Senators sensation Andrew (Hamburglar) Hammond, McDonald’s in Canada honored Canadiens winger Pacioretty with an Angus beef patty topped with bacon bits, tri-color nachos, cheese, tomato, onion and nacho sauce. 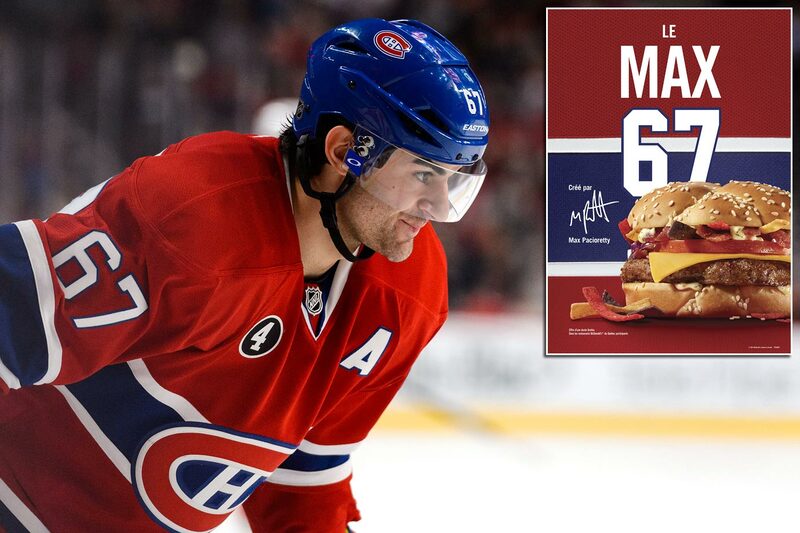 Here are 12 more notable comestibles that offer a distinct hockey flavor. 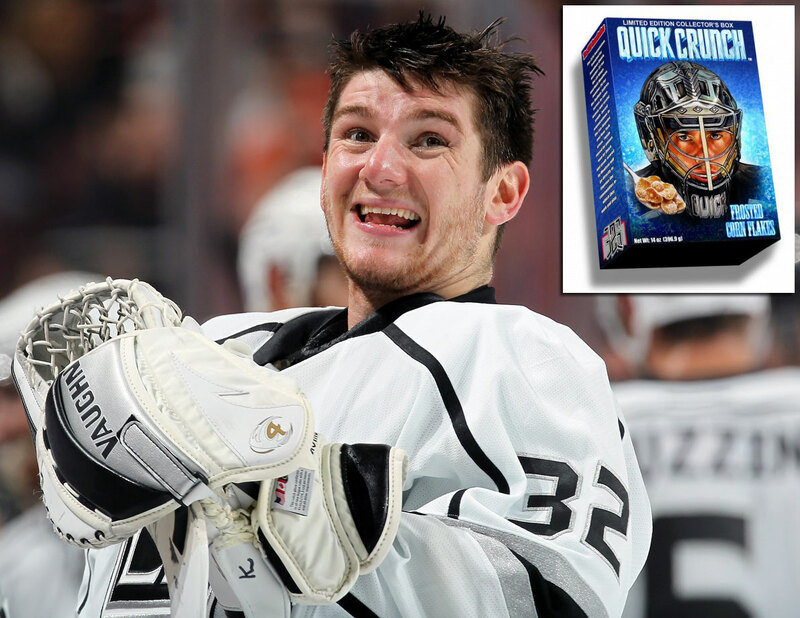 Cereal boxes, especially in Canada, have long been graced by the likes of Wayne Gretzky, Eric Lindros and other NHL icons. 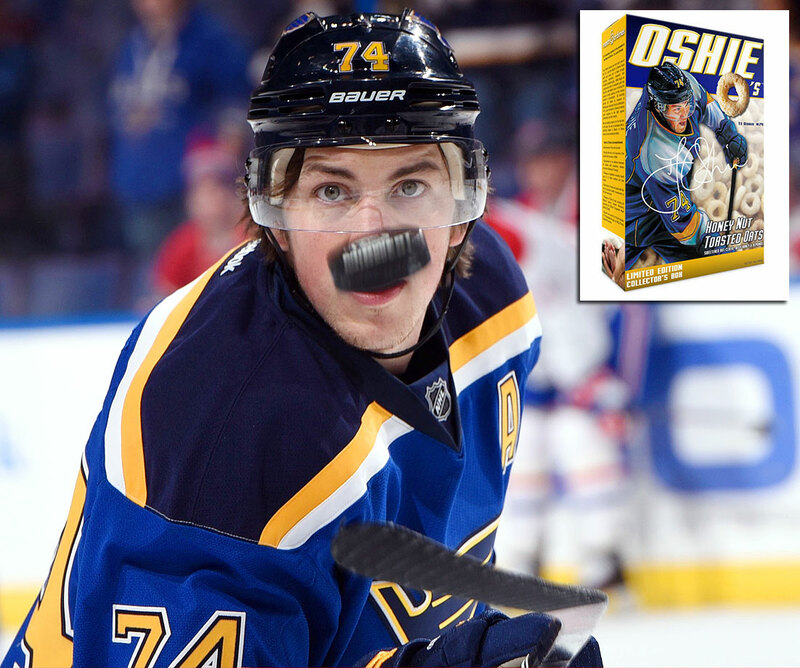 O-lympic legend Oshie is only one of the most recent NHLers to have a circular honey nut toasted oat cereal named in his honor. Each purchase benefits the March of Dimes. These mouthwatering frosted flakes are merely the official breakfast victuals of the Kings goaltender. Proceeds from sales go to his 326 Foundation. The Capitals' zany sniper joined such sports luminaries as Reggie Jackson, Ken Griffey Jr. and Shaq O'Neal in the grand tradition of having their faces on the wrapper of a candy bar. 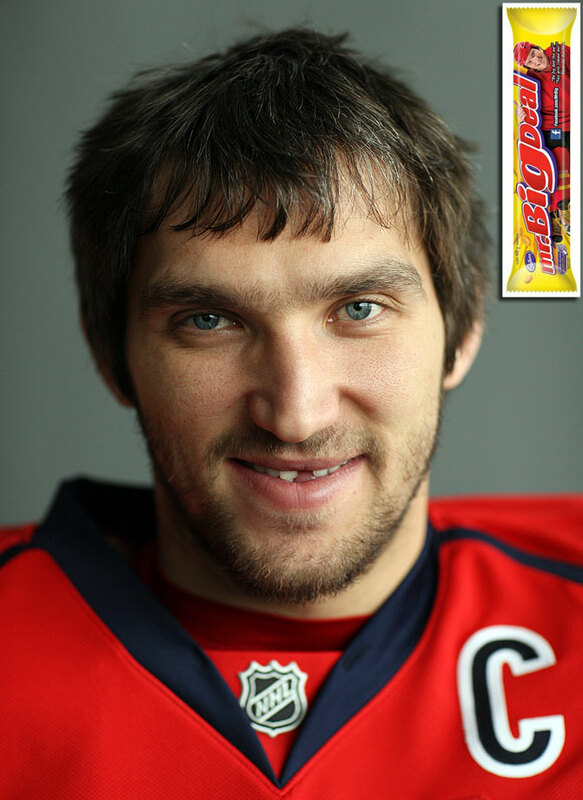 The Mr. Big bar, a chocolate confection popular in Canada, has been around for years and Ovie is merely one of its big name endorsers. 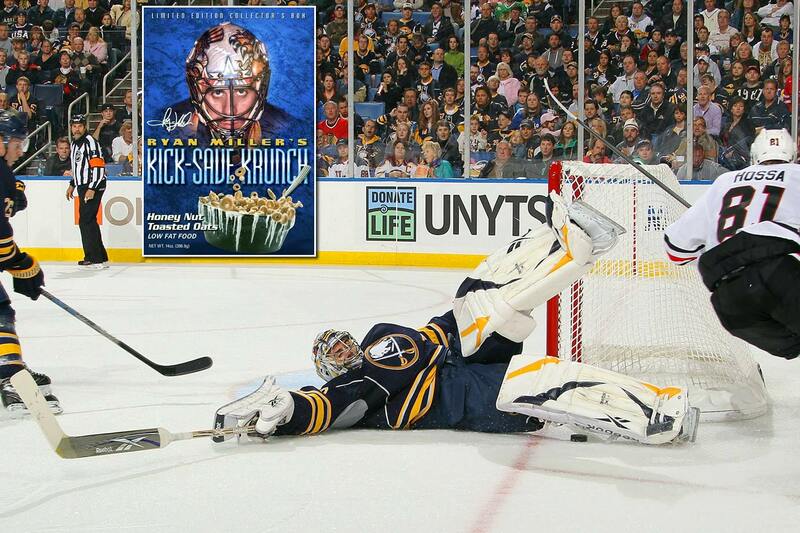 In 2010 the Sabres' star netminder began appearing on breakfast tables in the greater Buffalo area. Proceeds from sales benefitted his Steadfast Foundation. 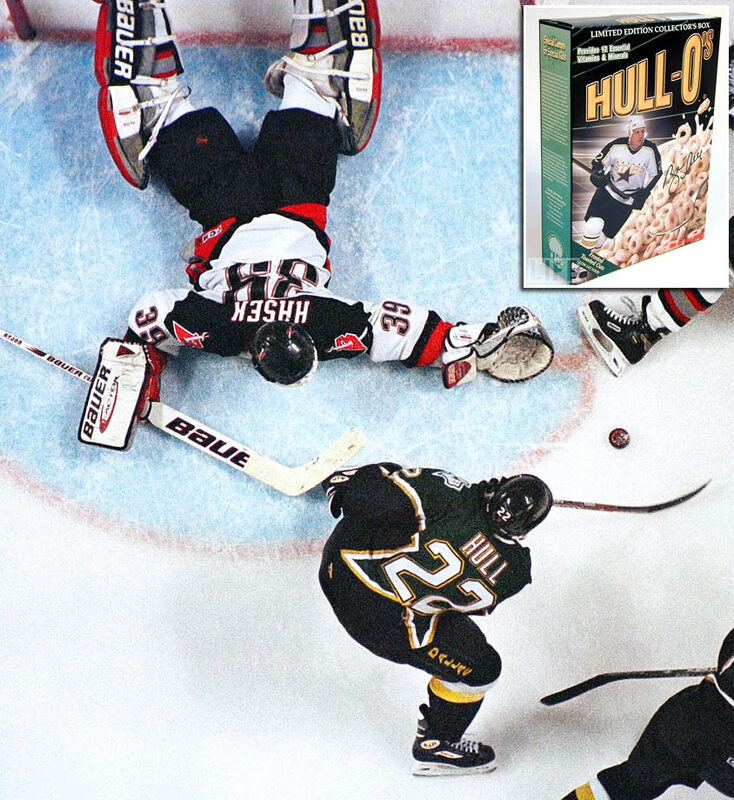 The man who won the Stanley Cup for the Stars with a controversial goal in the 1999 final ended up on a box of his own frosted toasted oats breakfast treats. No, his skate wasn't in the cereal. The Red Wings netminder won three of Lord Stanley's old silver bowls to fill with his own honey nut toasted oats (the cereal variety most favored, it seems, by athletes seeking to start the day with you). Besides leadership and scoring, the legendary Red Wings captain was good for 13 essential vitamins and minerals. 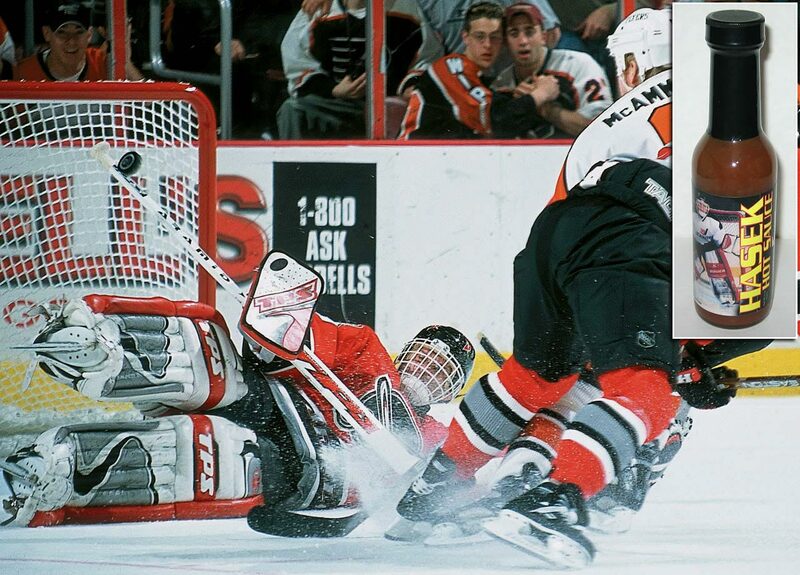 It was only natural, we suppose, that the Sabres' occasionally fiery goaltender would put out something spicy to slather on Buffalo wings. Produced by the aptly-named Buffalo Style Foods, sales of the Dominator's condiment benefitted local youth hockey programs. 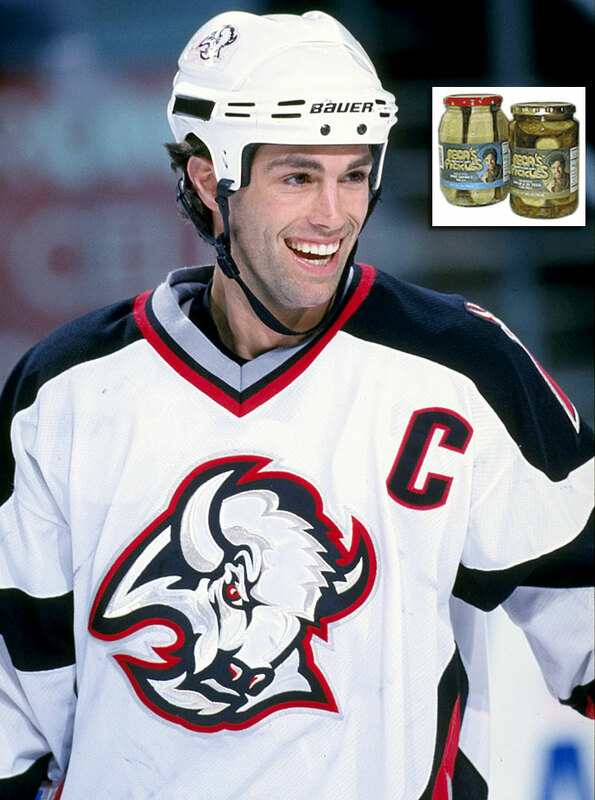 If Michael Peca picked a peck of impeccable pickles, how many impeccable pickles would Michael Peca have picked? No doubt, these buggers were as a gritty as the center whose name and mug graced the label. 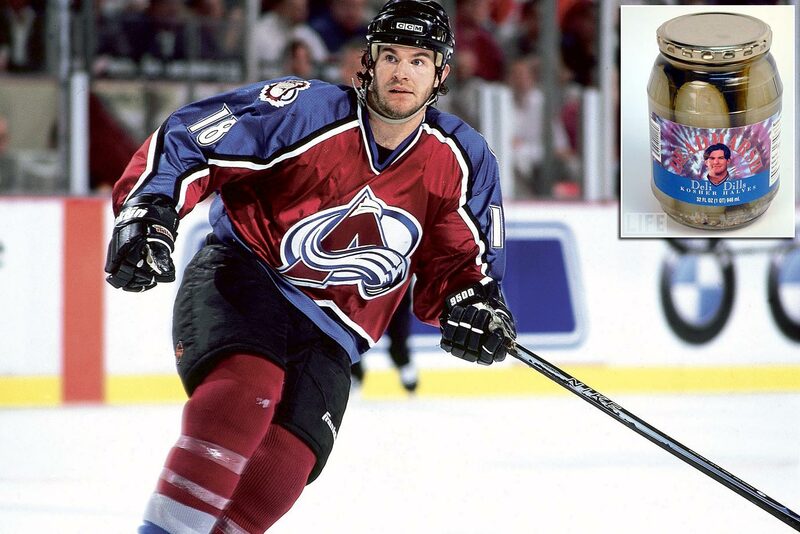 In the 1990s, the Avalanche winger's name skated on a line of deli dills (kosher, yet! ), pickle pucks (something to break your teeth on) and steak sauce. While dazzling spectators as a Penguin in the '90s, the mulleted Czech scoring star had his own creamy brand made by Public Labels Brands, Inc. of Pittsburgh and sold to benefit local charities. If you needed something to wash it down, Jagr's likeness also graced bottles of mineral water, but you had to go to his native Czech Republic to buy them. 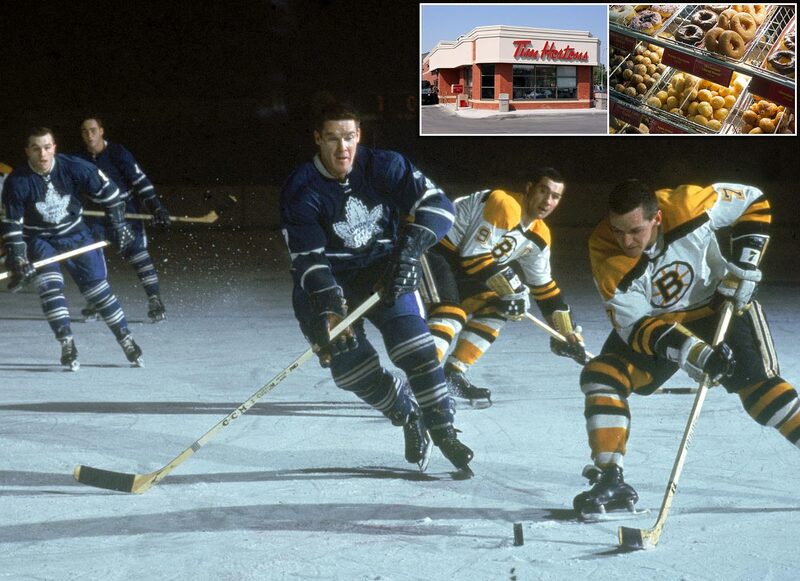 The most well known hockey-related food item was created in 1964 in Hamilton, Ontario by the Hall of Fame defenseman who played in the NHL for 22 years and won four Stanley Cups. His Apple Fritter and Dutchie varieties were hugely popular and today you can grab Tim Hortons donuts, coffee and hot chocolate at more than 1,800 locations in Canada and the U.S.